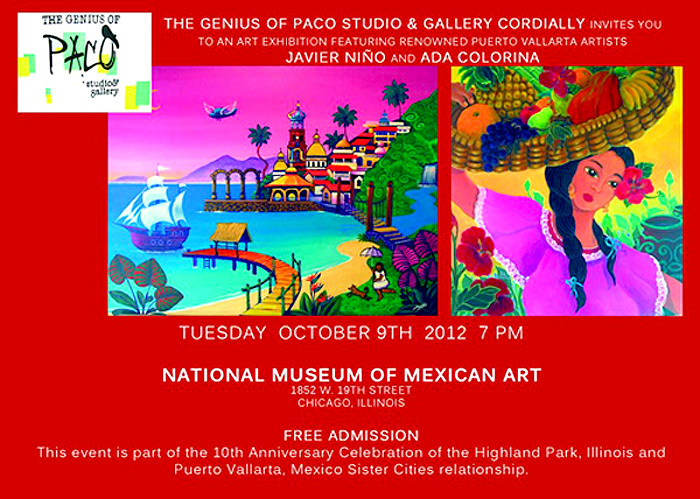 The Genius of Paco Studio & Gallery is very pleased to communicate and invite our friends and customers to the Fine Art Exhibition that we will be holding at the NATIONAL MUSEUM OF MEXICAN ART, in Chicago, Illinois, on Tuesday October 9th 2012 at 7 pm, featuring JAVIER NIÑO and ADA COLORINA two of the most significant and beloved artists from Puerto Vallarta. During the event, with free admission, the Puerto Vallarta Young City Orchestra will perform a string concert with an excellent selection of Mexican musical pieces. This great art exhibition will be presented as well on October 10th, 6:30 pm, at the Highland Park Country Club, over the Gala Dinner in celebration of the 10th anniversary of Highland Park, Illinois and Puerto Vallarta Sister Cities relationship.